Humanity has compartmentalized history into many different eras. The Middle Ages preceded the Renaissance, and the Enlightenment brought us to a more modern history. The 20th century is defined by plenty of iconic eras, from the age of flappers in the 1920s to hippies in the 1970s. Today, we live in an era dominated by one thing: avocados. Avocados have been around for centuries, originating sometime between 7,000 and 5,000 B.C. in southern and central Mexico. According to the California Avocado Association, avocado cultivation in the United States, however, didn’t begin until 1926, with the commencement of the Hass avocado industry in California. Hass avocados account for the United State’s greatest avocado profit, making up about 88 percent of avocado production in the nation. The closest competitor to the Hass would be the Florida avocado. 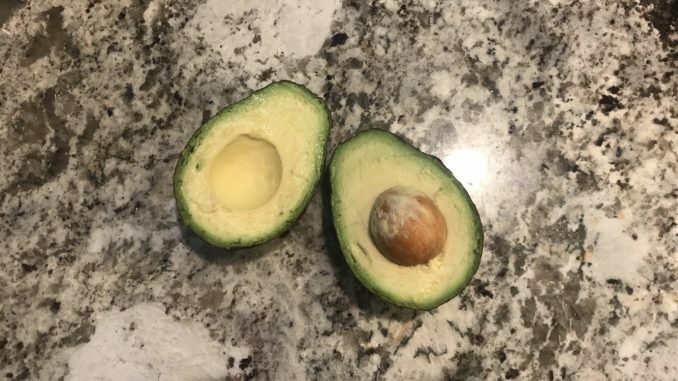 The Florida avocado, though, lacks the fat of a Hass avocado, thereby making it less rich in flavor and much more watery – two factors which can only be described as appalling to avocado fanatics. Rising awareness in the importance of healthy eating coupled with greater avocado availability and more successful marketing strategies gives the beginnings of an explanation as to why avocados have become so popular so quickly. But avocados are more than just the latest fad in American culture. In addition to being delicious, the green superfood has some key nutritional benefits, is extremely versatile in baking and can be used for much more outside of eating. So, sit back, relax and prepare to be amazed by the power of the avocado. In addition to being a good source of protein, fiber and potassium, avocados are filled to the brim with vitamins and minerals. One avocado contains one-third of the average person’s daily vitamin K and folate requirements as well as 20 percent of vitamin B5, vitamin B6, vitamin C, Vitamin E, and several other vitamin requirements. Having such a high fat content, avocados are dense in amino acids. Though society nowadays often likes to apply a negative connotation to the word “fat,” not all fats are bad, especially those in an avocado. These amino acids and healthy fats, mono and polyunsaturated fats, help lower cholesterol and provide the body healthy oils that are good for the heart. Not only are avocados healthy, they’re extremely adaptable in baking. To add in a nutritional boost, mashed avocado can be used as a substitute in recipes which initially call for butter, sour cream, or mayonnaise. Replace some of the less nutritious ingredients in your favorite brownie, cookie or even ice cream with avocado for a healthy twist to some of your guilty pleasures. Recipe-making with avocados doesn’t have to be all about hiding the flavor. Avocado-centric meals which emphasize the fruit’s natural taste are also a key ingredient to a happy life. For busy mornings loaded with work or school, you can start your day with the classic avocado toast. Not only will your taste buds thank you, you’ll be fueled-up and ready to tackle any challenge thanks to starting your day with a wholesome, balanced breakfast. If you’re not the biggest fan of savory breakfasts, don’t fret: Because of their versatility in recipes, there are plenty of ways to get in your daily dose of avocado in the morning. You can easily make a sweet spin-off of avocado toast by topping it off with sliced strawberries and a drizzle of honey. Or, if you’d like to forego the toast and try something different, you can easily throw avocado into any of your favorite smoothie recipes. Eating avocados isn’t the only way to reap their nutritional benefits. Because they are so densely packed with amino acids, avocados can also play a key role in moisturizing skin and repairing damaged hair. When applied topically, amino acids work as antioxidants to strengthen the skin and ward off signs of aging. Moreover, they work to transport water from one place to another, keeping skin hydrated and healthy. Thus, using mashed avocado as hair and face masks is one way to gain these benefits in a nontraditional way. In addition to acting as a moisturizer, avocados have been found to treat some moderate to severe skin conditions, such as psoriasis and eczema. Although incredible, avocados are not magical, and thus cannot completely cure such conditions. Applying the flesh of an avocado or even just avocado oil to affected areas, however, can offer some relief. Users often report reduced itchiness and inflammation as well as a soothing effect. Although trends fade, avocado’s recent surge in popularity is anything but a fad, and it’s bound to stick around. With the average price of a single avocado being around two dollars, avocados may not be the kindest investment for your wallet, but there’s a reason avocados are in such high demand, which elicits their higher price. Versatile, nutritious and delicious, avocados are the key to making hearts not only healthy, but happy too.